Remember when you were asked to stop the war on fun? That’s a cute slogan, but, according to the speakers at Flux Summit‘s panel discussion last night, the problem is getting worse. 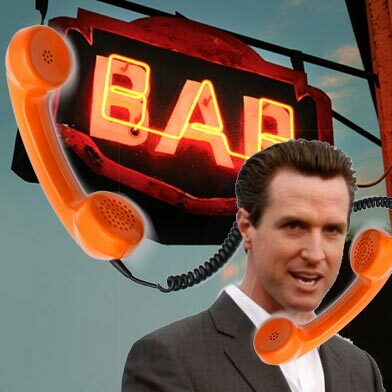 According to the panelists, the bars, venues and clubs in your neighborhood aren’t only in danger of shut downs – they are enduring violent police raids at the command of state-run California Department of Alcoholic Beverage Control (ABC). This is no joke, San Francisco, because the comedy venues are closing too. According to the speakers, patrons of the arts are undergoing abusive assaults at venues, being physically searched on the spot, with employees pushed around, up against a wall, in every neighborhood around the city. They even say that there are videos of the raids, but that you can’t see them because they’re considered evidence and therefore not public. But heed the news presented by the panel: music venues, bar owners & licensed party-throwers are reportedly getting handcuffed, their offices turned upside down, their computers seized, hit with fines that are impossible to meet. In order to understand the desperate call for help from the entertainment commission, it’s vital to understand the politics behind it. When you serve alcohol at a party, venue or bar, an ABC license is required – but that license also puts you at risk for scrutiny, because that license also grants ABC the right to “protect the state of California” by enforcing the license they grant. ABC itself filters to local divisions, where they match up with the Police Department, facilitated by one man, who reports to the mayor. Sounds great, but it’s seemingly a mess. Entertainment Attorney Mark Rennie (representing Great American Music Hall, Slim’s & 18 other SF venues) explained that the owners of GAMH are not concerned about making money as much as they are about “doing it right and putting on good shows,” evidenced by their free yearly blue grass festival in the park. Meanwhile, Rennie argued that11 accusation packages were filed against clubs (The Fillmore, Bimbo’s, Slim’s to name a few) simply because the venues had changed their cuisine from mexican to french fries over the course of the last 10 years since the licenses were written. “Part of the problem is a lack of focus on better planning, like not putting housing near venues,” points out Debra Walker, “the bottom line is that now people live near venues and they are calling police with complaints,” but even that doesn’t extend to all of the venues. Tim Benetti (co-owner, Bottom on The Hill) mentioned that Bottom of The Hill has always had great relationships with neighbors and few, if any, noise complaints. favorite venue, bar or party – or, if you’re an artist, ensure that you’ll have a place to perform? 1. Write about it. We’re a city of bloggers under siege by the California Department of ABC. And, by the way, it’s happening all over the state! Get to work. At Flux Summit, the owner of Mojitos stood up and asked the crowd, “Why isn’t anyone writing about this? Where is the SF Weekly or the Chron? We are being strongarmed. When I go into work after this and the police show up like last night, what do I do?” He went on to describe their violent raid – just 2 nights ago. Bloggers, social media makers, internet artists, get on it. 2. Call The Mayor Day – Debra Walker suggested it, and everyone heard her. Call The Mayor Day is Tuesday February 9th. So, spread the word, sign up on Facebook or Plancast so you get a reminder and can share it with friends. For our first Call The Mayor Day, participants will call him to ask him to stop raiding our venues and destroying our livelihood and culture. Gavin can be reached at (415) 554-6141. 3. Go To More Shows – this one is obvious. Support your local music venues. They have ridiculous legal fees right now. Take your friends. Stop asking for guest list slots. You aren’t that important if you aren’t the artist on stage. 4. Join & Follow The California Music & Culture Association – this is a new association designed to preserve our state’s cultural lifeblood. Please support them by following CMAC on Facebook. 5. Shhhhhh & Hold Your Bladder – try not to be so noisy outside of the venues and bars and parties you love. Please don’t pee on peoples’ property, even if you can’t hold it. Lower your voice, just a little. Stop screaming like a crazy person on your way home. Just for now. You can yell when you call the mayor on February 9th.